Dronfield Floral Art Club A.G.M. The public are invited to attend. 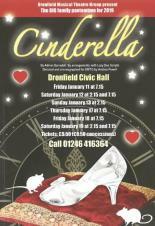 It's pantomime time in Dronfield again, and for 2019, the Dronfield Musical Theatre Group are presenting the most famous and popular pantomime of all time; Cinderella. As usual it's a fun-packed show with lots of pantomime silliness and the usual ingredients that make Dronfield's BIG family show so special. So come and boo the ugly sisters; cheer the handsome prince and the lovely Cinderella and laugh at the antics of Buttons and the brokers men. There's something for young and old which makes Cinderella such a magical show for a good old fashioned family outing. XHTML 1.0 validated. WCAG compliant. Page generated in 0.1296 seconds.